The most complicated and technologically advanced supercar in the world turns five years old in 2010. In honor of that birthday, we've decided to revisit some of the Bugatti Veyron's more impressive statistics. This is what $1.7 million buys you. The images in this gallery are courtesy of Denver-based photographer Ronnie Renaldi. If you'd like to view more of his work, his website and Facebook page are the best places to start. If you'd like to view this story on a single page, click here. Eight liters, sixteen cylinders, 64 valves, four (just four!) camshafts, four turbochargers, and a "square" bore-to-stroke ratio (86 mm by 86 mm). 1001 hp and 922 lb-ft of torque. At the Veyron's 253-mph top speed, the whole mess consumes 47,000 liters of air per minute — as much air as one man breathes in four days. Former Car and Driver editor Csaba Csere once asked Bugatti development boss Wolfgang Schreiber how the Veyron's engine could be rated at 1001 SAE net horsepower at 6000 rpm for the U.S. but only 987 horsepower (1001 PS) for Europe. Schreiber laughed, saying, "The production engines are all putting out between 1020 and 1040 PS — enough to cover both promises." Above 120 mph in the Veyron's Handling Mode, the car's rear wing acts as an air brake. When the brakes are applied, the wing adjusts itself to a 55-degree angle of attack in just four tenths of a second. This is claimed to provide almost 0.7 G of braking force, or roughly as much as the brakes of an ordinary passenger car. The Veyron's EPA-certified fuel economy is 8 mpg city, 13 mpg highway. At top speed, it achieves three miles per gallon, or 1.4 gallons per minute. The PDA seen here — an HP iPAQ — is included with purchase; it talks to the car's telemetry system via Bluetooth and sends data to the Bugatti service team. It can also operate the navigation system. These are the optional Sang Noir wheels. They cost $120,000 extra. And yes, we realize this picture has nothing to do with that. Still, note the leather-covered window switch. Nice. The Veyron uses special Michelin PAX tires found on no other car. They were designed specifically for the Bugatti's capabilities and can only be removed from the wheels in France, a process that costs $70,000. The tires themselves cost $17,000 per set. The Veyron's handbrake has its own anti-lock system. 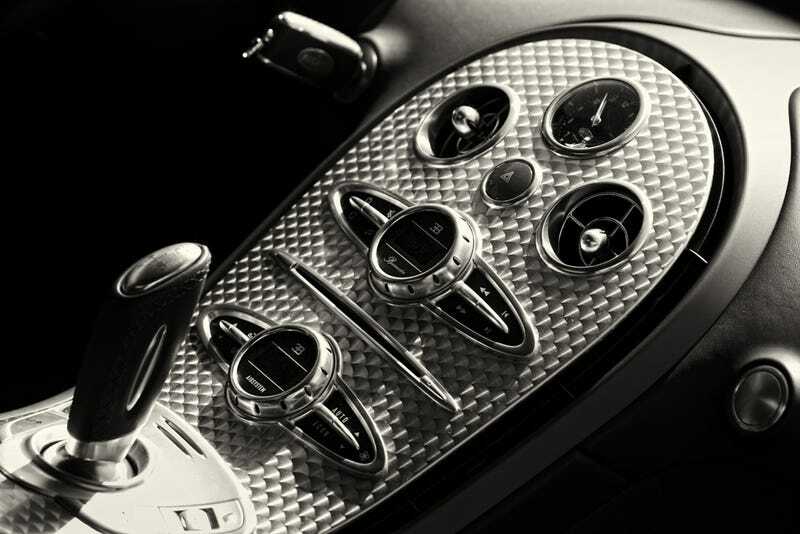 The Veyron's seven-speed, twin-clutch Ricardo automatic costs over $120,000 to replace. At 250 mph, the Veyron's tires will last fifteen minutes. Its 26.4-gallon fuel tank goes dry in twelve. When you take your foot off the Veyron's throttle at its top speed, aerodynamic drag slows the car down at 0.3 G. Most people experience a similar force while braking for a highway off-ramp. This is the car shown in this gallery. This footage in this clip was filmed at California's Mojave Airport during a top-speed run. Yep. That's fast. As if you needed us to tell you that.